Free bikes and shuttle service rooftop drinks and a Long Island City locale bring the A-game to the non-smoking Z NYC Hotel. The 14-story Z NYC Hotel furnishes 100 rooms with floor-to-ceiling windows free Wi-Fi flat-panel LCD TVs iPod docks and international calls as well as bathrooms with heated floors plus premium towels and toiletries. Enjoy cocktails and panoramic views via the rooftop bar and feast on flavors in the in-house restaurant. Guests can also check out a free bike work anytime in the 24-hour business center and book an in-room spa service. Pets are allowed for a fee. Complimentary hourly shuttle service to area sites is also included. 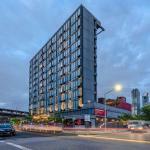 Set in Long Island City the Z NYC Hotel lands guests within a 10-minute walk of Queensbridge Park and multiple subway lines. Take a 20-minute subway ride to reach the base of Central Park as well as MoMA and high-end Fifth Avenue Shops. The heart of Times Square is three miles away. LaGuardia Airport is within eight miles of the hotel.